In April 1912, the MAB took over the provision of relief for the capital's 'casual paupers' or vagrants which, according to the 1910 census, numbered over 25,000. Prior to this, casuals had been catered for in the workhouse casual wards operated by twenty-eight separate Boards of Guardians. Typically, a casual would stay one or at most two nights at each workhouse. In return for a night's lodging, three hours labour were required, or nine hours for a two-night stay. Work for men was usually stone breaking or oakum picking. Women also picked oakum or did washing, scrubbing or needlework. However, conditions had varied enormously with vagrants flocking to those wards where detention and work were not enforced, while beds remained unfilled in stricter establishments. A typical casual ward of this period was the one at Whitechapel on Fulbourne Street. Casuals waiting at entrance to Whitechapel Workhouse, 1902. The casual ward was fitted out with hooks and rails between which low hammocks were slung. One common form of work was picking oakum — teasing apart the fibres of old ropes. By 1921, the number of casual wards still in use in had fallen to six, but an increase in demand during the 1920s led to an increase in provision. By 1929, nine were in operation (Chelsea, Hackney, Lambeth, Paddington, Poplar, St Pancras, Southwark, Wandsworth and Woolwich). Conditions in the remaining wards were gradually improved — the dietary was revised, newspapers were provided, and the old deterrent labour tasks such as stone-breaking were largely done away with. 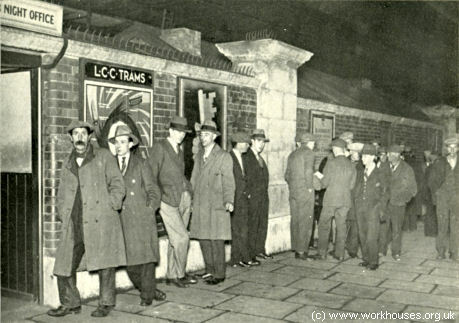 At the end of 1912, the Board set up a central clearing-house for casuals known as the Night Office, originally located on a disused steamboat pier near Waterloo Bridge, and from 1921 at Charing Cross railway Bridge. The Night Office had telephone links to the remaining casual wards, and also with the Salvation Army, Church Army, and other voluntary organisations. Casuals requiring accommodation were assessed at the Night Office and given a ticket to provide admission to a specific casual ward or charitable institution. Numbers applying at the Night Office fell from 3,000 a month when it first opened, to around 1,400-1,600 a month following the First World War. The MAB Night Office, c.1930. As well as providing overnight accommodation, the Board also attempted to assist helpable casuals to become self-supporting. In 1923, it opened The Hostel in the former Holborn casual ward on Little Gray's Inn Lane (now Mount Pleasant), where those genuinely seeking employment could reside in more amenable conditions than the casual wards. From 1924 to 1929, between 1,000 and 2,500 such people were admitted each year. Gray's Inn casual wards (later The Hostel) site, 1916. 'The Hostel' on Mount Pleasant, 2011.